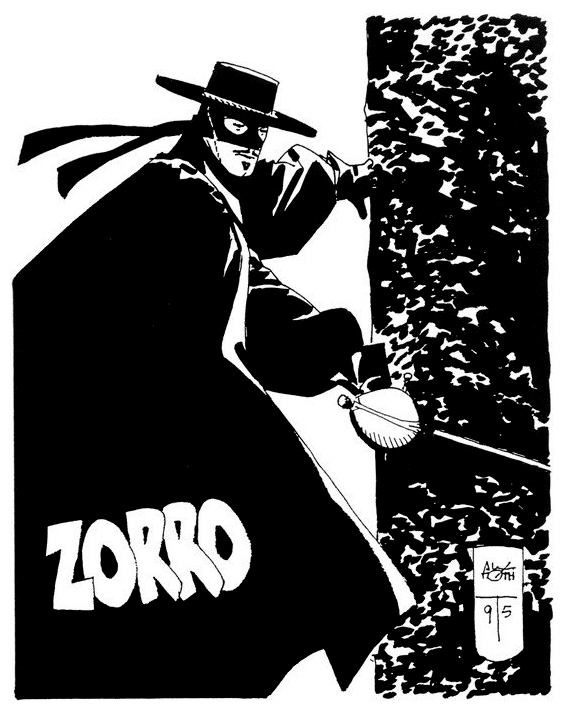 Zorro by Alex Toth. 'Nuff said. Toth takes advantage of his simple gag of with a decent punchline to play with angles, action, composition, sound effects, lettering and tone in what amounts to one heckuva page! He utilized the two-tone Craftint paper to great effect for lighting and contrast. Just take a gander at the wonderful black-spotted curves, angles and shapes Toth uses in each panel and throughout for superb page composition. Panel 5 is probably my favorite as the driver threads the needle between the two semis going opposite directions. Though the car is nearly centered in the frame, the rest of the composition is dynamic and asymmetrical, with the trucks and center line of the road in perfect perspective. I love the slight curve of the horizon line, those bold, dotted center lines shooting right us, the stark shadows on the semis, those headlights poking from the shadows. Gorgeous! In each frame, the car is fairly small, but drawn from a different angle in each, all the details spot-on. 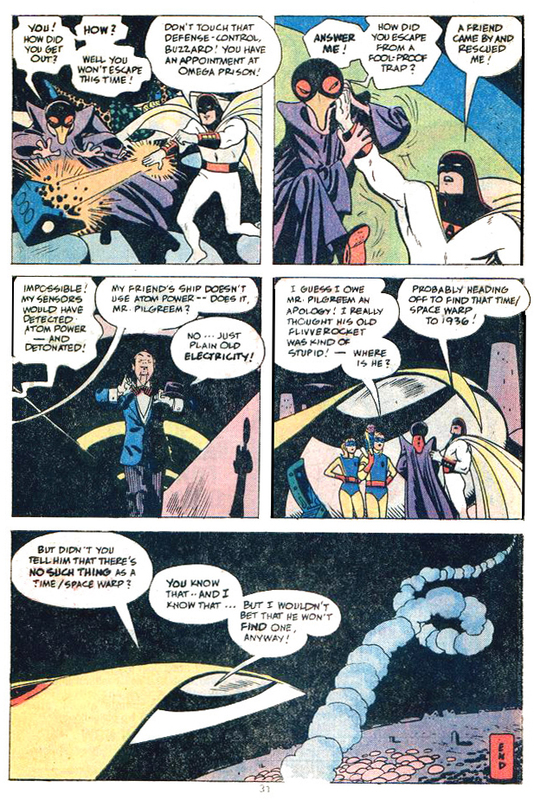 It's evident Toth had a blast drawing this page! Some artists love the Craftint look so much, they've developed methods to replicate the effect digitally. 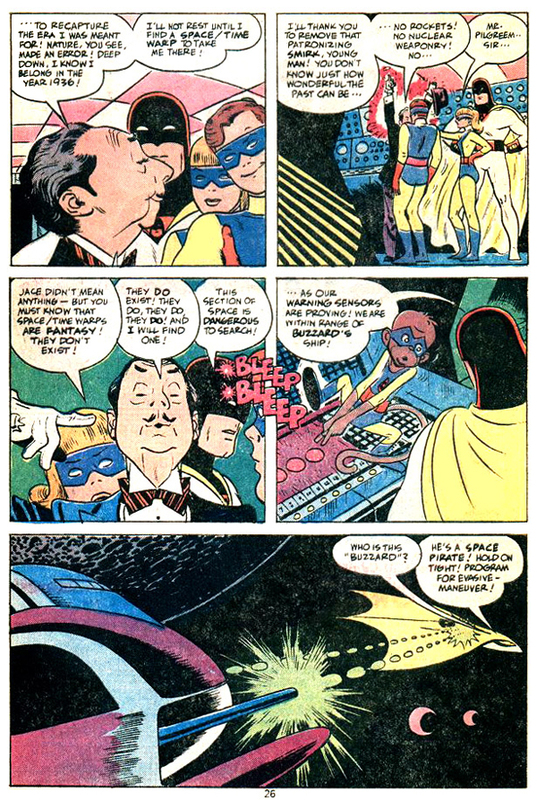 Another super page by Toth from his mid-'60s CARtoons, collected in the now-rare One For the Road - Toth employed a less cartoony style for this one-pager, tho the sarge's face in the last panel for the punchline is comical. Great page composition here with a variety of angles to balance the page. Clever bits throughout like the badge shape for the title, the superb use of perspective (that unmarked vehicle in panel 1 - WOW! ), low-angle shot for panel 3 and nice use of craft-tint board for tones and texture. Though more realistic, the drawing is still as simple as can be with so many details still there. 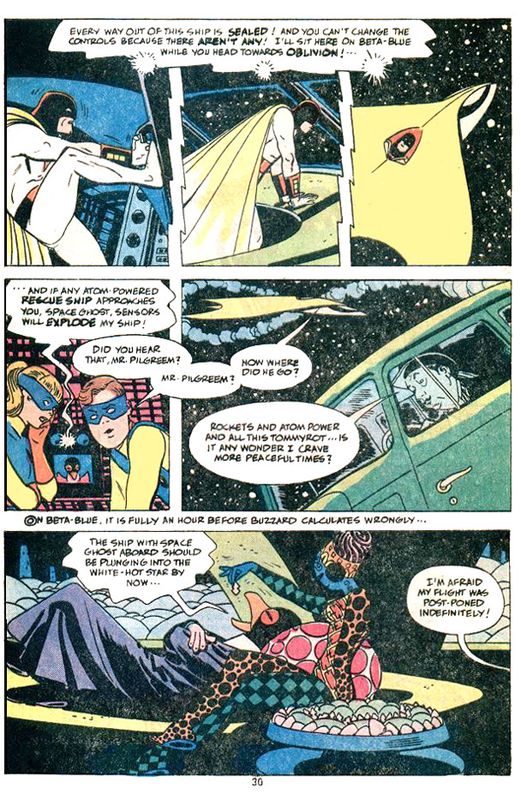 That figure in panel 4 kills me - it could come off as awkward, but is natural as the young cop approaches the vehicle. 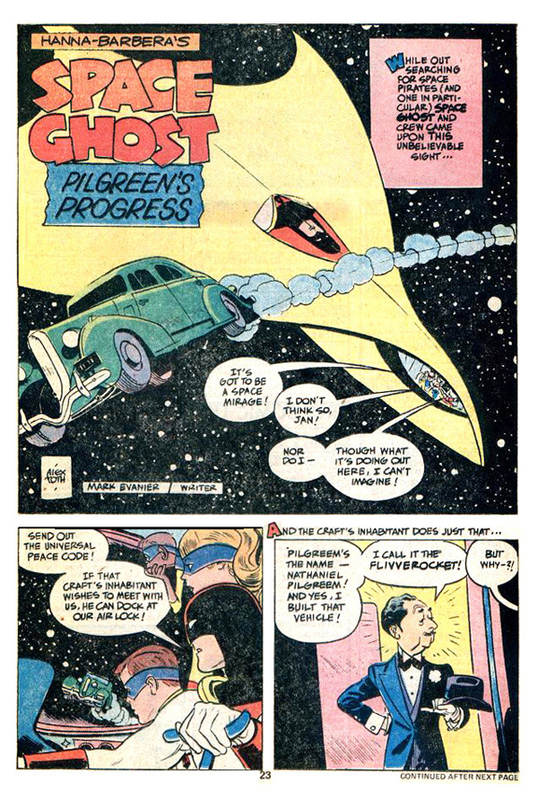 My only complaint is the placement of the word balloon in panel 3 - no need to have placed it over the bumper of the car in panel 1. Could've/should've been placed at the bottom of the panel - plenty of room. More CARtoons next week...! I don't get the final gag, exactly, 'cept the decal guy is a poser/neophyte, but the characters and cartooning here are great! Toth effortlessly swings a cartoony and expressive style here, one that'd easily have fit in the pages of MAD magazine in its early heydays. Superb movement, gesture and body language in this panel (above). The sweep of Mr. Decal's legs as he works under the hood - those folds! That short, stocky kid leaning in, toy dragster in tow. Lovely! Wonderful faces and expressions in the middle panel of the page: the dude all nonchalant with his single-tooth smile; that kid with the over-sized Harry Carrey glasses - fun! This is the kind of cartooning we'd see more and more from Toth the rest of his career - in his character designs for cartoons, his one-shot humorous strips and daily doodles. Embarrassed, the guy makes his exit in a pose that is positively Kurtzmanesque! (More here.) Even in this simple frame of three figures with no backgrounds, notice how Toth finds way to place shadows on his figures for depth, direction and design. So many sweet details: the big grin, the spastic motion lines, dangling cigarette, questions marks over Dad's head, the twisty chinstrap, and that kid and his goofy glasses! So good. More CARtoons next week...! Fun display/title lettering, a kooky narrator hanging for the side of the page, and some wild, graphic skateboarding action! The dialogue is playful, nonsensical gibberish, a bit of boppin' beatnik poetry which leads us to a zig-zag path, scattered stars, silhouettes and sound effects. As the Beach Boys said, these comics are "Fun! Fun! Fun!" Just a joy! These comics sparkle with electricity and energy - dazzling! In the mid-'80s, Toth did a handful of covers for collections/reprints of Frank Robbins' Johnny Hazard. The first is particularly clever, in regards to concept, composition and color. I blew out the color and most tone for the cover to #2. The colors did absolutely nothing for me, detracting from a decent action cover. The colors for the third are better, though faulty. 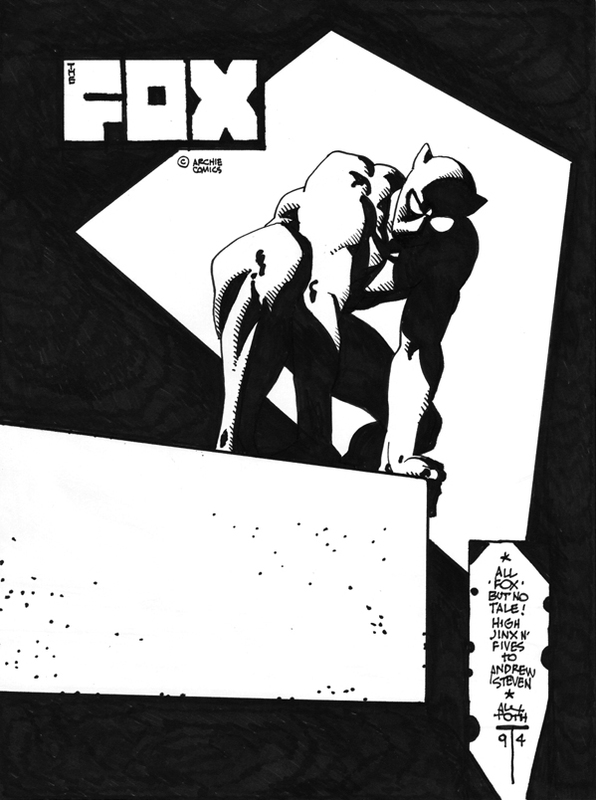 Cool composition and angle by Toth here. Another action cover for the 4th. Bright, primary colors in the main, with a nice use of white and umber shadows. 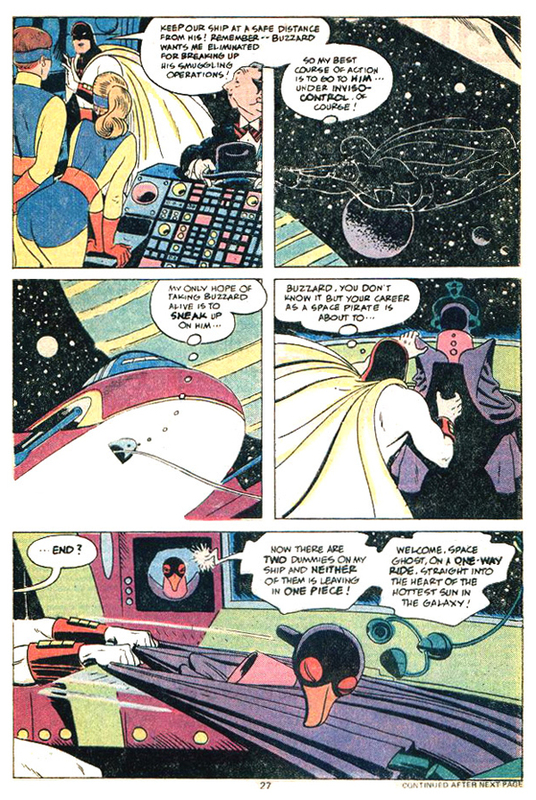 All in all, Toth did justice in tribute to one of his comic strip heroes. The first volume of a new series collecting Johnny Hazard dailies is now available. You're kiddin' me, yeah? What a great sketch! I'd never seen this one before. Man, so good! Not much for me to add, except: superb composition, positive/negative space, what balance - you can feel the hero's weight and weightlessness. Every line is in its place, just a smidge of rimlighting here and there, sometimes clean, sometimes with a rough edge. Clever: the space in the "O" is the Fox logo. I love that The Fox's eyes are different sizes/shapes.